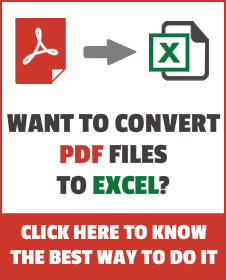 Excel HLOOKUP function is best suited for situations when you are looking for a matching data point in a row, and when the matching data point is found, you go down that column and fetch a value from a cell which is specified number of rows below the top row. It returns the specified matching value. lookup_value – this is the look-up value that you are looking for in the first row of the table. It could be a value, a cell reference, or a text string. table_array – this is the table in which you are looking for the value. This could be a reference to a range of cells or a named range. row_index – this is the row number from which you want to fetch the matching value. If row_index is 1, the function would return the lookup value (as it is in the 1st row). If row_index is 2, the function would return the value from the row just below the lookup value. [range_lookup] – (Optional) here you specify whether you want an exact match or an approximate match. If omitted, it defaults to TRUE – approximate match (see additional notes below). The match could be exact (FALSE or 0 in range_lookup) or approximate (TRUE or 1). In approximate lookup, make sure that the list is sorted in ascending order (left to right), or else the result could be inaccurate. 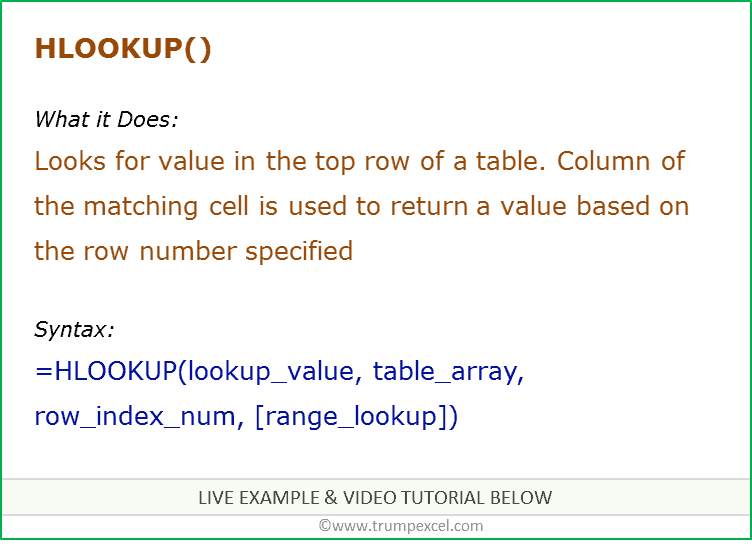 If the HLOOKUP function can not find the value, it returns the largest value, which is less than the lookup_value. It returns a #N/A error if the lookup_value is smaller than the smallest value. If lookup_value is text, wildcard characters can be used (refer to the example below).